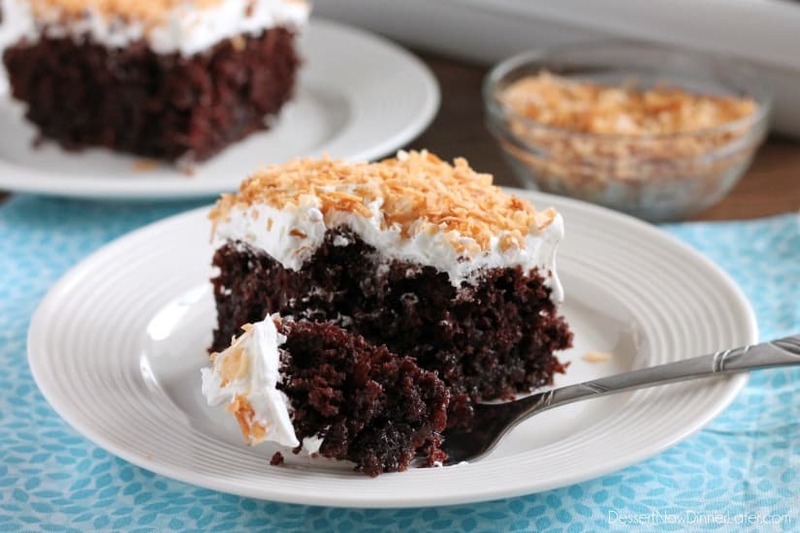 Coconut Cream Chocolate Poke Cake - Dessert Now, Dinner Later! 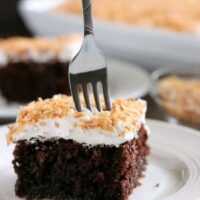 Coconut Cream Chocolate Poke Cake – an easy box cake makeover with cream of coconut, toasted coconut, and whipped cream! This cake is a knock-off of my original Coconut Cream Poke Cake recipe that I have on my blog. It’s a chocolate poke cake version, that is just as good, and is sure to please your chocolate loving guests! One of my favorite parts about this cake is that it starts with a cake mix and comes together quite nicely and fairly quick! The most work you have to do is watch the coconut as it toasts so it doesn’t burn. 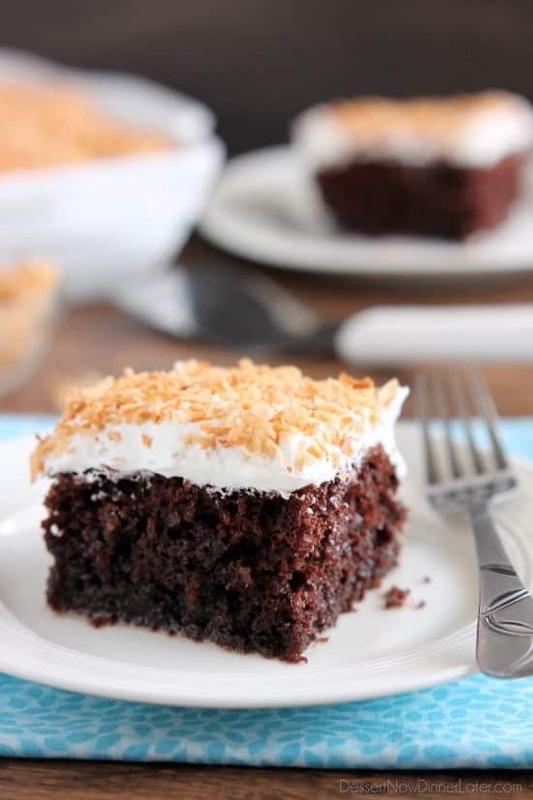 The addition of the toasted coconut on top is another one of my favorite qualities about this cake because it’s so crisp, and contrasts wonderfully with the tender, moist cake and whipped cream on top! The number one reason why I love this cake so much, is that it’s soaked in cream of coconut. If you have no idea what that is, it’s this sweet coconut cream that is used for pina coladas and is very versatile. Find it in the aisle with the alcoholic mixers or Mexican foods aisle. I’ve used cream of coconut in a lot of things like Coconut Cream Fruit Dip, Frozen Coconut Limeade, and No Churn Coconut Ice Cream to name a few. It’s ridiculously amazing! Anyway, if you are looking to try a new cake, or need something easy to bring to a potluck, this is the cake for you! So delicious! 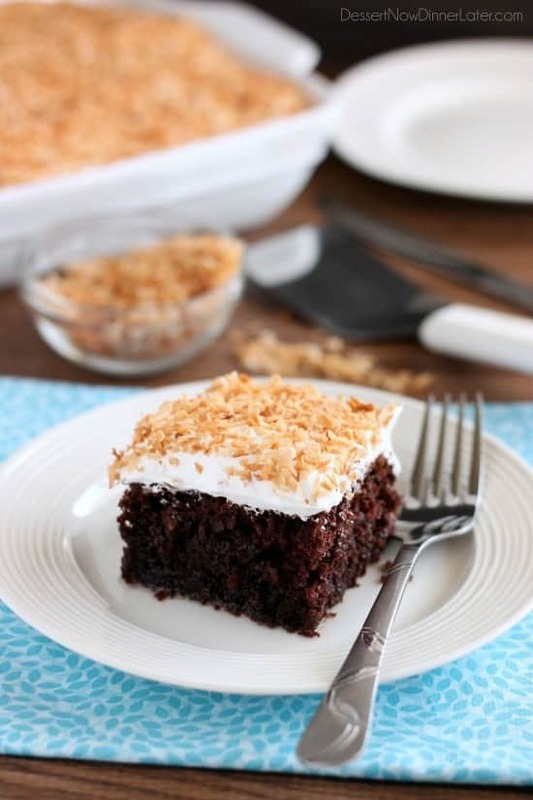 An easy box cake makeover with cream of coconut, toasted coconut, and whipped cream! Prepare and bake the cake according to the directions on the box for a 9x13-inch pan. Make sure to grease your dish before adding the cake batter. My cake baked at 350 degrees Fahrenheit for 34 minutes. Allow cake to cool to room temperature. Meanwhile, toast the coconut on an un-greased baking sheet at 350 degrees Fahrenheit for 3 minutes. Stir it up, and then continue baking and stirring every 30 seconds to 1 minute or until golden brown. Coconut browns and burns quickly, so stay right by the oven and stir it frequently. Allow the toasted coconut to cool. 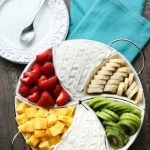 Using a fork or wooden spoon, poke holes all over the top of the cooled cake. 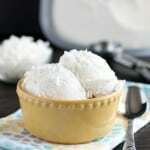 Open the can of Cream of Coconut, empty it into a 2-cup measuring glass and heat it for 15 seconds in the microwave. Whisk the mixture well and then pour it all over the cake and into the holes. Allow the cake to soak up all of the Cream of Coconut, about 5 to 10 minutes. 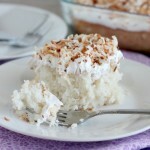 Frost the cake with cool whip and sprinkle the top with the toasted coconut. Cut and serve immediately. Keep leftovers refrigerated. 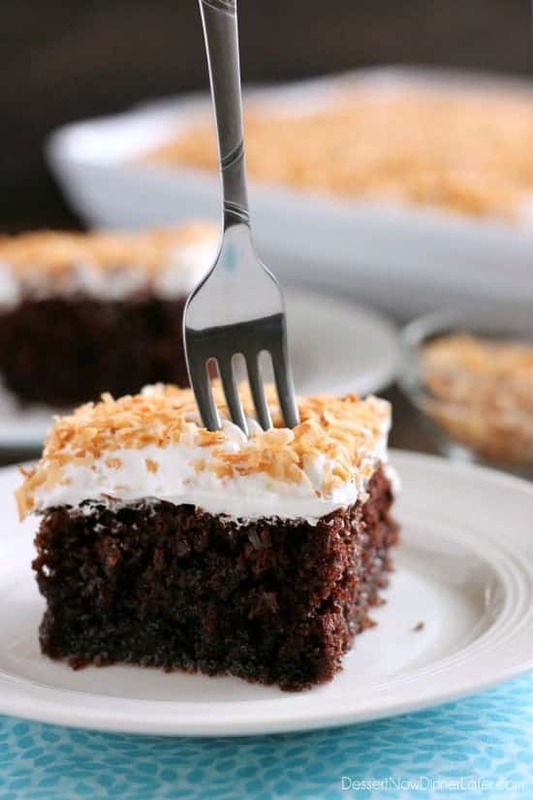 This cake can be prepared ahead of time and be stored in the refrigerator, just wait to put the toasted coconut on top until just before serving it, if you want the coconut to stay crispy and not go soft. Gotta love simple and delicious! You’ll have to let me know if you try it! Wow this sounds absolutely decadent! Thanks Carolyn! It’s satisfying indeed! Since coming across your original recipe I have made it over and over again. I’ve had requests for it as well. Just the other day I made it for another potluck and the thought crossed my mind how it would taste with chocolate cake. A week later your chocolate version recipe was in my e-mail box. Love this cake! This totally made my day! I’m glad we were thinking on the same page! I bet lemon cake would be good too! The possibilities are endless! 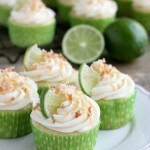 I love that coconut cream on top with the toasted coconut. 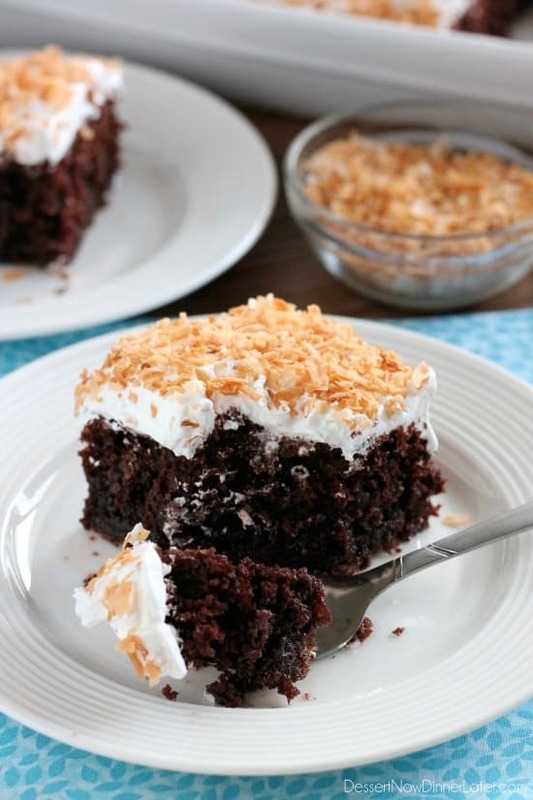 Coconut and chocolate just go together, this looks fantastic! Thanks Danielle! It was super yummy! This poke cake looks seriously so delicious and rich.. I can imagine how good it must have tasted. Love anything chocolate & coconut related! Coconut and chocolate are definitely a winning combo! Thanks Thalia! It’s an addicting cake for sure! Glad you are a coconut lover too! Thanks Patty! I hope you love it! Oooh!! I’m swooning over the thought of this gorgeous cake being soaked in coconut cream! It looks so ultra-moist I just want to sink a fork into that slice!